•	Special sales events, savings opportunities, and coupon codes are going to be sent out via email to those that sign up for the free email newsletter subscription provided by BathStore.com. Customers will have the chance to sign up for this free service immediately upon visiting the BathStore.com homepage, and those that do will find all kinds of special member only offers in their inbox on a regular basis. •	Sometimes special clearance merchandise will be marked down by as much as 50% or more off of traditionally advertised prices. Visit the CLEARANCE section for more information. •	Special promotional offers will be advertised on the homepage of the BathStore.com site from time to time. Check back regularly. Bathstore is a UK-based retailer offering bathroom suites, baths, showers, basins, toilets, furniture, and other items for your bathroom. You can also find products related to heating and lighting, including ceiling lights, electric underfloor heating, and shaver sockets. Free deliveries are included with orders that go over 299.00. Suite styles include transition, contemporary, traditional, boutique, timeless, and easy bathing. Furniture possibilities includes vanity units, space-saving units, and worktops. You can also find a variety of storage needs, such as wall cabinets, corner cabinets, and sink cabinets. Traditional, timeless, and contemporary toilets are available, in addition to contemporary tiles, waterfall bath taps, square shower trays, bath panels, shower valves, and much more. 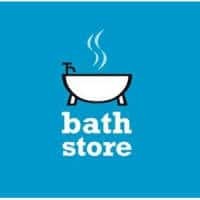 For most up to date offers check out Bathstore on Facebook and Twitter or contact Bathstore Support for any questions.